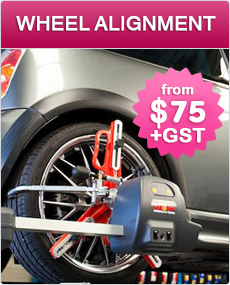 Giving your car a wheel alignment every six months or so is part of a good automotive service program. Your tyres will last longer, your car will drive more smoothly and you’ll save on those petrol bills. At Tyre Girl Onehunga the team offer comprehensive wheel alignment and balancing services for all makes and models, including up to 3 tonne truck wheel alignments. We are open 7 Days and have a full mechanical workshop onsite so we can look at any other car servicing or WOF needs you may have through our sister company Mayne Automotive. You notice uneven tyre wear. Characteristically, misalignment-induced wear occurs on one side, or edge, of the tyre. Your car pulls to one side when travelling in a straight line. Your fuel consumption is higher than it used to be. Your car seems to fight against the steering. Your steering wheel is off-centre when the car is travelling in a straight line. Toe – refers to the position in which the wheel, when viewed from above, sits in relation to the centre of the car. If a wheel is “toed in” it is angled towards the centre of the car (think pigeon toed). If it is “toed out” it is angled away from the centre of the car. Toe problems cause wear and “pull”. Camber – describes how perpendicular the wheel is. If the top of the wheel leans towards the car it is said to have positive camber. If it leans out, it has negative camber. Camber problems cause wear and pull. Castor – measures the position of the left and right wheels in relation to each other. Sometimes one of a pair of wheels is set further forward or back than the other. Castor problems don’t cause uneven wear, but they do contribute to pull. A check of the front end and steering linkage for wear or excess play. An adjustment of the front and back pairs of wheels so that they are parallel to each other and perpendicular to the ground. Sometimes, in the interests of economy, an alignment is performed on only the front pair of wheels. Your car, however, runs on four wheels and so it makes sense, wherever possible, to get a full, four-wheel alignment. If your tyres are badly worn on one edge and you get your wheels aligned, the tyre will then only make contact with the road on the unworn section. This partial contact is unsafe and the tyres should be replaced – speak to your mechanic. Wheel alignment can be thrown out by hitting the curb or a pothole, or simply by the stresses of driving. If you notice tyre wear, or that your car pulls to one side, visit a wheel alignment centre as soon as you can. 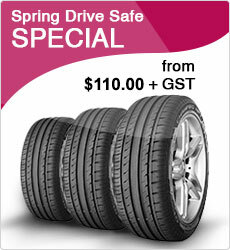 You’ll save money in the long run on tyres and petrol, and driving will be a more pleasant experience. Give us a call on 09 622 2449 or make an enquiry through our website to find out more about our wheel alignment pricing and deals.